Sportiness doesn't have a great deal to do with power. Some of the worst sporting family-sized cars often pack quite a lot under the bonnet, then flounder when presented with a twisting country road. 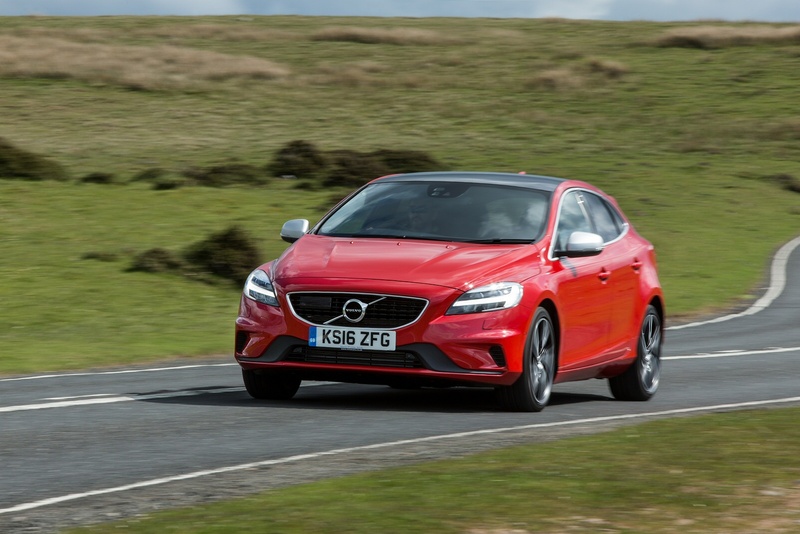 But to the surprise of some observers, Volvo's V40 has proved to be a satisfying drive, even in its humblest guises. The kind of car indeed, that begs to be dressed appropriately, perhaps with the R-Design trim package that Volvo expects over 25% of UK customers to choose. Just because running costs prevent you from owning a truly potent hot hatch doesn't mean you can't own a car that looks like one. And even better, something that walks the walk as well as talking the talk. Something like Volvo's improved V40. This is the brand's first truly impressive, truly dynamic compact car - something which is hardly surprising perhaps given that it rides upon the underpinnings of the best handling family hatch on the planet, Ford's Focus. Here we're looking at the R-Design trim package that emphasises the way that this car can reward like no small Swedish model before it. A package that both outside and in, aims to make its owner feel special. Whichever, after all, is what buying a premium-badged compact family hatch really should be all about. You can specify it with any of the engines in the V40 range. And if you do so, you'll probably still end up paying less than you would for more basic-looking rival models from BMW, Audi and Mercedes. A potentially tempting prospect. 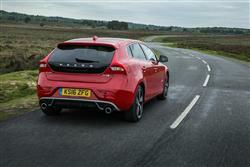 We could have opted for any variant in the improved V40 range in evaluating this R-Design package. In the event, we settled on a drive in the 190bhp D4 diesel model, good for sixty from rest in just 7.4s on the way to a 143mph maximum. Like other models in the line-up, it delivers a very good compromise indeed of absorbent ride and assured handling composure, even if - or perhaps especially if - you don't go for the optional Sports chassis set-up. 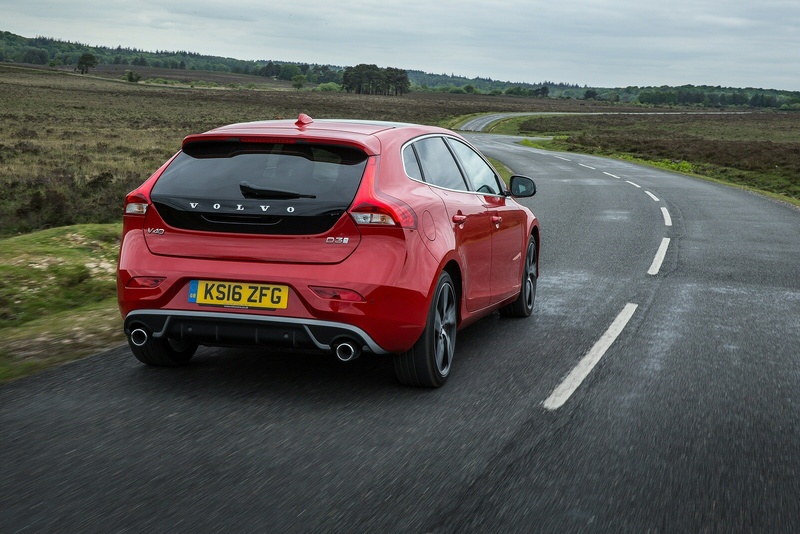 Engine-wise, most potential V40 diesel customers will probably be quite happy with one of the lesser V40 diesels, either the 120bhp D2 or the 150bhp D3. Both get the brand's latest Drive-E 2.0-litre engines. In the entry-level D2 it's no ball of fire of course - 62mph takes 10.5s on the way to 118mph - but it's as fast as most will need it to be. Low mileage buyers need to factor in the possibility of petrol power too, especially if they don't like the rather clattery diesel noise you get on start-up. T2 and T3 variants use a 2.0-litre four cylinder 'Drive-E' unit in manual form - and rather curious, a 1.5-litre unit if you order them in automatic form. Either way, the power outputs are the same, T2 and T3 variants resectively putting out either 122 or 152bhp. The T3 is good for sixty in 8.3s on the way to 130mph. If that's not enough, there's a flagship T5 model putting out 245bhp, good to flash past sixty in 6.4s en route to 149mph. So, what will set your V40 apart if you opt for it in R-Design trim? Well, let's start outside where there's a silk-metal framed high-gloss grille with re-profiled front bumper and daytime running lights. The sporty stance is further enhanced with an ironstone rear diffuser, silk-metal finished details, twin exhaust tailpipes and five-spoke diamond-cut 17 or 18-inch alloy wheels. Inside, the interior gets a TFT instrument display, a sports steering wheel, sports pedals and unique aluminium inlays. The seats feature a blend of black Nubuck textile and perforated leather, crowned by an embroidered R-Design logo with a blue "R". Full leather seats are available as an option. Those wishing to further enhance their vehicle can upgrade to the R-Design Lux level which adds additional features, such as embossed full leather-faced upholstery, active bending xenon headlights with headlight cleaning system, a rain sensor, cruise control, keyless start and rear theatre lighting. This facelifted V40 gets a smarter front end, courtesy of the addition of revised LED headlamps that feature the so-called 'Thor's Hammer' style that's already been seen in the brand's larger XC90, S90 and V90 series models. A smarter grille mesh completes the more confident look. And inside? Well the idea is that, like IKEA furniture, this cabin should be typically Scandinavian, comfortable, simple, intuitive and visually pleasing. And broadly it is. 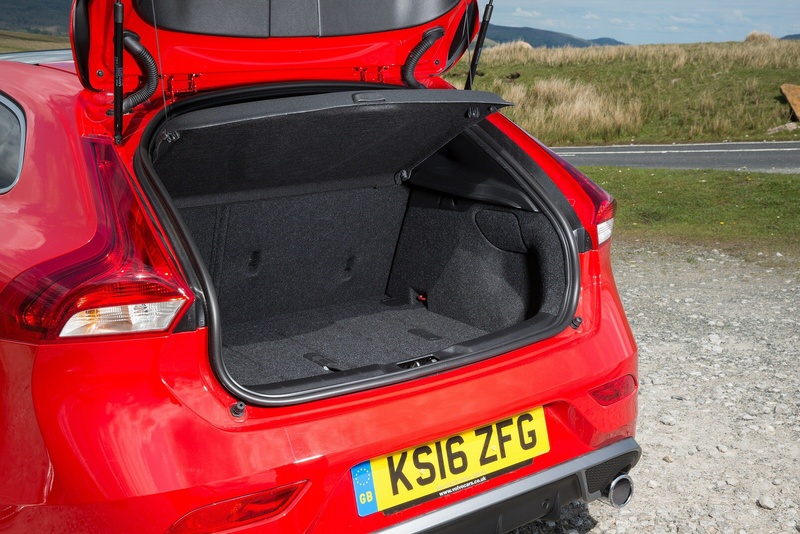 Cabin space is fine and there's a 335-litre boot. There's a premium of just over £2,000 to order the R-Design package on your V40. That means a V40 D2 diesel, a car that would normally demand around £21,000 from you, could in this guise set you back just under £26,000 if you opted for the 'Lux Nav' variant. 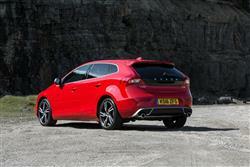 At the other end of the scale, a top V40 R-Design T5 Geartronic Lux Nav variant will need a budget of around £32,000. Essentially, what you need to know is that even with R-Design included, this car can still undercut comparable versions of German-badged rivals like BMW's 1 Series, Audi's A3 and Mercedes' A-Class. 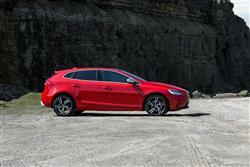 As well as the interior and exterior R-Design package niceties, all V40s already come decently equipped. Whichever model you choose, it'll come complete with electronic climate control that also cools the glovebox, plus leather-trim for the gear knob and for a steering wheel that has audio controls for an eight speaker stereo with USB and iPod inputs, operable via the same 5-inch colour screen you can use to set up the Bluetooth connection for your 'phone. Safety-wise, there's a world first - an under-bonnet airbag that springs out to protect pedestrian in the event of an impact. Plus of course, you get all the usual basics. That means dual-stage front airbags on both sides, side airbags, a knee 'bag for the driver, inflatable curtains, ISOFIX childseat fastenings, a Roll-Over Protection system, the WHIPS anti-whiplash system and, to hopefully make sure you'll never need all that, the DSTC Dynamic Stability and Traction Control system, the usual ABS braking assistance, Corner Traction Control, Engine Drag Control to stop the wheels from locking during engine braking on a slippery surface and even a Trailer Stability Assist system if you've fitted a towbar. If you want the safest car in the family hatchback class, you're looking at it right here. If you want the reason why more than 60% of all UK V40 customers will end up buying the least powerful 120bhp D2 diesel variant, then you don't have to look far to find it. This model is capable of a headline-grabbing 78.5mpg on the combined cycle and a 94g/km of CO2 reading that'll side-steps the need for road tax and payment of the London congestion charge. Step up to the 150bhp D3 and it's not as if you've entered a world of big bills either. That averages 74.3mpg and emits a mere 99g/km of CO2, figures identical to those in the 190bhp D4. And the 2.0-litre petrol models? Well both 122bhp T2 and 152bhp T3 models average around 52mpg on the combined cycle and put out not much more than 127g/km of CO2, the kind of figures you'd have expected from a good diesel not so very long ago. Don't expect those kinds of returns from the thirsty five cylinder T5 variant though, a car that'll make you pay much more heavily for your pleasure, the CO2 figure rising to 137g/km. If you�re looking for a new Volvo V40 T3  R DESIGN Nav Plus 5dr Petrol Hatchback for sale, you�ve come to the right place. 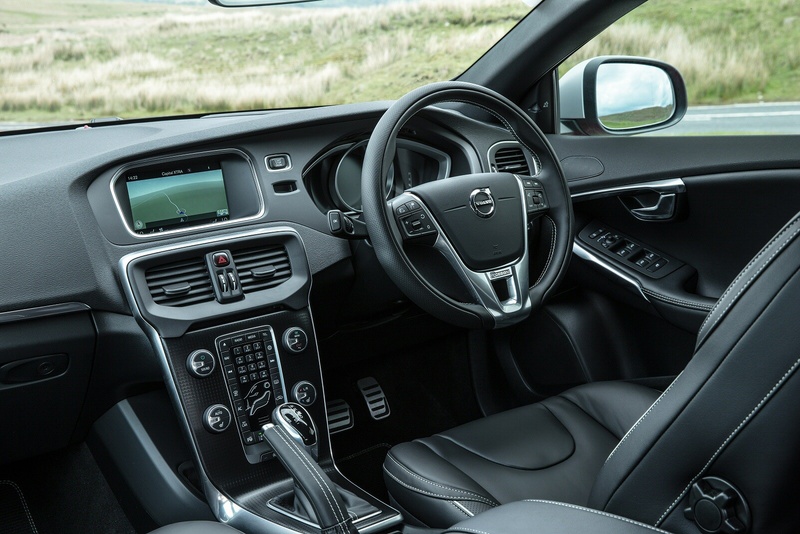 At Bristol Street Motors we don�t just have the best Volvo V40 T3  R DESIGN Nav Plus 5dr Petrol Hatchback deals, we also offer friendly advice and help with all your enquiries to ensure your buying experience is a happy experience.